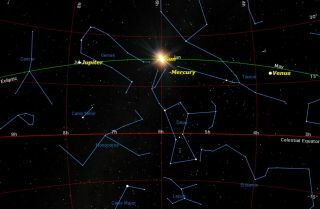 The sun reached its northernmost point in the sky on Saturday, June 21, at 6:51 a.m. EDT. This is called the summer solstice in the Northern Hemisphere, and the winter solstice in the Southern Hemisphere. June 21, the day of the northern summer solstice, was hailed by much of the mainstream media as "the longest day of the year." But I've always been of the opinion that this term is somewhat misleading. Actually, the longest day of the year comes on the first Sunday of November, when we set our clocks back one hour at 2 a.m. to account for the end of daylight saving time and return to standard time. By virtue of adjusting our timepieces back one hour, we're making the day 25 hours long. That might lead some to say that at the time of the summer solstice there are 15 hours of day and 9 hours of night. Not true! When the sun is below the horizon, what we experience is not always necessarily what one would refer to as "night." Indeed, there is a period called twilight, which occurs just before sunrise and right after sunset. The glow we see in the pre-sunrise sky we have come to call "dawn;" the interval right after sunset is what we call "dusk." The reason we have twilight is that the sun illuminates Earth's atmosphere for a while before it rises and after it sets. The predictions of astronomical twilight in most almanacs are based on the rule that dusk ends (or dawn begins) when the center of the sun's disk is 18 degrees below the horizon — a standard measurement that dates all the way back to the time of Claudius Ptolemy, around 130 A.D.! There are two other forms of twilight in addition to astronomical twilight. Nautical twilight is when the center of the sun lies 12 degrees below the horizon and only general or vague outlines of objects are visible. This is the point when the horizon becomes difficult to perceive (in the evening) or starts to be distinguishable (in the morning). The term dates back to the days when sailing ships navigated by using the stars. Indeed, at the beginning or end of nautical twilight, many of the brighter stars — those of 1st and 2nd magnitude — are visible to the unaided eye. Civil twilight, on the other hand, is when the center of the sun lies 6 degrees below the horizon. At this time, there is enough light for objects to be clearly distinguishable; outdoor activities can commence (dawn) or end (dusk) without artificial illumination. Civil twilight is the definition of twilight most widely used by the general public. In some newspapers, for instance, you might see a notation on the weather page: "Turn lights on," which refers to the end of civil twilight when drivers are to turn on their headlights. Twilight lasts even longer at more northern latitudes. When one reaches 49 degrees north (the Canadian city of Winnipeg, for example), astronomical twilight does not end at all around the time of the summer solstice. And in northern parts of Eurasia and North America, bright twilight can last through much of the night. From Glasgow, Scotland, for instance (latitude 55.9 degrees), astronomical twilight persists all night long from May 6 through Aug 7 and nautical twilight lasts from June 4 through July 9. And heading north of latitude 60 degrees, civil twilight lingers through the night (sometimes referred to as "white nights"). North of the Arctic Circle (latitude 66.5 degrees), the sun remains above the horizon for 24 hours on the summer solstice, reaching its highest point at local noon, and then appearing to skim just above the northern horizon at midnight — the so-called "midnight sun." At this time of year, the northernmost portions of Norway, Sweden and Finland are experiencing this effect. In northern Canada, one place where you can see the midnight sun is the small Inuit hamlet at Resolute on Cornwallis Island. It has been said that "Resolute is not the end of the world, but you can see it from here." Home to about 215 people and 110 houses, Resolute is also known as "Qausuittug"("place with no dawn"). Indeed, the sun shines for 24 hours a day there from April 29 to Aug. 13. The length of twilight depends on how long the sun takes to drop 18 degrees below the horizon. At the equator, where this motion is perpendicular to the horizon, twilight lasts only 75 minutes. That's why people who live in northern climes are usually surprised how quickly it gets dark at this time of year when they venture south for a tropical vacation. Where they live, some perceptible light in the western part of the sky might persist for two hours or more after sunset, but from Central America and the Caribbean, the sky for all intents and purposes has already become quite dark just an hour or so after sunset.